With the application by Karl-Sander Erss, UT student of genetic engineering and Joonas Põder, law student, you can find your future home by price, location, number of rooms or other conditions. “In case of a successful deal, we ask people to evaluate the property owners—did they keep to the agreement, did the apartment correspond to the photos and descriptions. This way, next tenants know whether to trust or avoid the owner,” the students described the personal aspect of the service. The young men are certain that through the Konku app, the owner can get to know their future tenant better than through any real estate agent. “Our site has recommendations and warnings about potential tenants—who kept the apartment in the state it was given to them, who left behind cigarette smell and scraped surfaces,” described the entrepreneurial UT students and they are certain that by personal feedback, property owners will find the tenant they like the best. Winners of Kaleidoskoop, authors of Konku, Karl-Sander Erss and Joonas Põder, will go on an award trip to SLUSH, the biggest start-up company conference in the Nordic, taking place in Helsinki, and get a development advisor to further develop their idea. Several special prizes were also awarded. 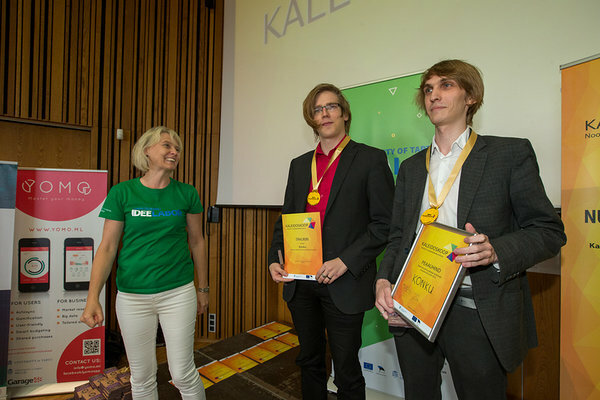 For example, the prize of Tartu City Government and eco-innovation went to team Gleather, which included students of UT Materials Science and Entrepreneurship and Technology Management and a student of Design and Crafts at the Estonian Academy of Arts. The team is developing alternative leather made of gelatin. So in the future, every other home might have a couch with a so called leather cover made of gelatin. Entrepreneurial youth with new ideas are welcome at Idea Storm, the opening event of the autumn Idea Lab, on 22 September 2016. Have a look at all special prize winners and judges at ideelabor.ut.ee. Kaleidoskoop is funded by the European Social Fund.